The pointlessness of war and the slaughter of men at the word of fools at the top of the hill has been a poignant and depressingly timeless subject of war films since their very inception. One of the most powerful of these films is Stanley Kubrick’s Paths Of Glory(1955) which portrays the most infuriating yet believable tales of injustice. The film deliberately accentuates the contrasts between the generals and the soldiers found on the front line of the First World War. This is gritty and realistic depiction of the mud soaked trenches of No Man’s Land; an area of constant explosions and bullets littering the air. There is no rest bite here for the viewer or the characters. If the enemy is trying to kill them at random, the company of Kirk Douglas are trying to be executed by the higher ranked officials of the army for showing “cowardice in the face of the enemy”. The film is split relatively simply into two halves. The first half consists of the preparation for the storming of an enemy ant hill and boasts the most visual action of the film. Kubrick’s single point vision, that characterises his work so distinctively, is perfect for roaming and skulking through the trenches capturing the fear on the faces of the soldiers minutes before they’re sent to their death. 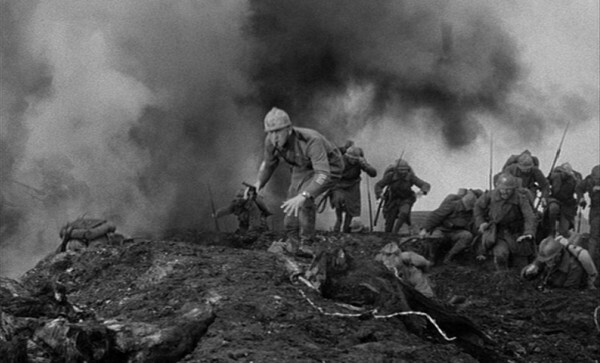 Unlike other war films, Paths Of Glory’s action sequences aren’t pleasurable even though they’re beautifully shot. They instead pack an emotional punch and the absurdity of the orders given by General Mireau make it frustrating as Douglas eventually blows the whistle for the men to go over amidst heavy shelling and fire. The German army aren’t the true villains of this film, if that is the right phrase. General Mireau is the most evil and callous presence on screen as he tries to order the shelling to be moved onto his own company with their failure to go over due to the intense barrage pinning them down. This is the real crux of the film and one that defines Kubrick’s war films, whether it be this or Full Metal Jacket (1987). The generals sit and drink in mansions and are more concerned with scandal than the lives of their own men. The second half of the film concerns the fate of three soldiers who are chosen from the regiment pinned down to be court marshalled and executed to show “discipline” and that retreat is not an option. With one chosen despite winning medals for bravery previously, one chosen because of his different race and the other chosen at random, the trial they are put on seems a farce. At no point are they given a fair one and Kubrick rings every ounce of tragedy and anger out of this situation. After fighting within the cells, one of them has to be executed while tied to a stretcher, such is the ruthlessness of the high commanders. Another of the soldiers breaks down as the three of them are taken to the shooting posts where they are executed. Kubrick is often critiqued for making cold films but here the viewer can’t help but be moved at the injustice and the reactions of the victims as they breathe their last breath. Afterwards the other men are treated to a show which consists of a German woman. However this really shows the truth about where the loyalty should lie. At first the men are shouting and whistling, drowning out her singing because of their lust for her as a woman. As they start to listen closely though, their humanity is rediscovered as they are moved by the song and start to sing along, realising that the Germans are people too, not just the enemy and highlighting the fact that the people moving the pawns should really be in their line of fire. Whereas many war films end up quite enjoyable and generally adventure stories, Paths Of Glory is no such film. It’s an uncomfortable and gripping reflection on class clashes and the death of idealism in the face of war. A timeless and endlessly vital film that has as much to say about the moral stance of action today as it did in 1955. Hi there,I watched a film-A Very Long Engagement (Jean-Pierre Jenut) before and then I watched that film. I notice that the way they filmed the shots of the men in battle in Paths of Glory is somewhat similar to that. I find this film be interesting and Kirk Douglas was amazing! It does have some similar shots though it also has that wonderful colour pallet that Jeunet always uses which looks great. Yes I love Jeneut’s films,they are so wonderfully whimiscal. Ahhh you did not know that?